Bill Johnson has enjoyed metalworking for over 35 years. But it wasn’t until late in 2001, when he was called upon to create a custom piece of religious artwork for his church, that he found divine inspiration. As Bill’s church worked on a building project, they adopted a focused prayer activity in which each family prayed over individual nails. As the nails began to build up in the Pastor’s office, Bill was asked to use his love of metalworking to create something special that could commemorate the building project. After weeks of prayer and meditation on what to do, Bill was touched in a special way by the Holy Spirit. “The idea came to me to construct a cross from the nails. This entire form of the cross would be made from nails and from a distance it would be very visible as the shape of a cross. But when the viewer would draw nearer to the cross, he would notice that there is something written in it, with the words fashioned from the nails. These words were welded to the surface so as to only be seen if one were to approach the cross,” says Bill. The resulting piece of artwork was met with great encouragement from his church family. It was then that Bill decided to share both his testimony and his gift. He formed Iron Nature, an Annville based company that specializes in these unique and faith-driven pieces of art. 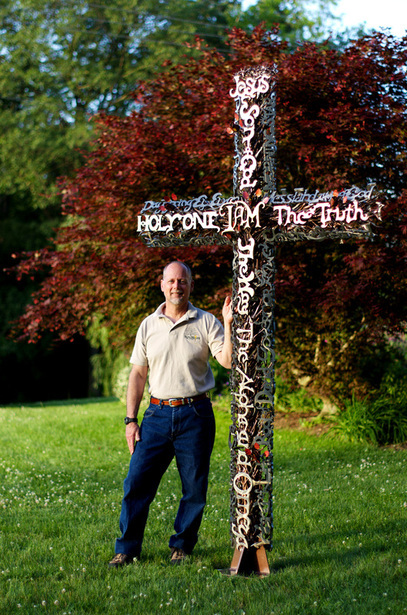 Since that initial project, Bill has fabricated over a thousand crosses that have been displayed across the continental US, as well as Africa, England, United Arab Emirates, South Korea, and Australia. Bill’s art doesn’t stop there. In addition to crosses, he has constructed various other pieces – both custom designs and his copyrighted pieces – all with the same intention: to share the love of God and create a conversation piece that launches meaningful discussions of faith. 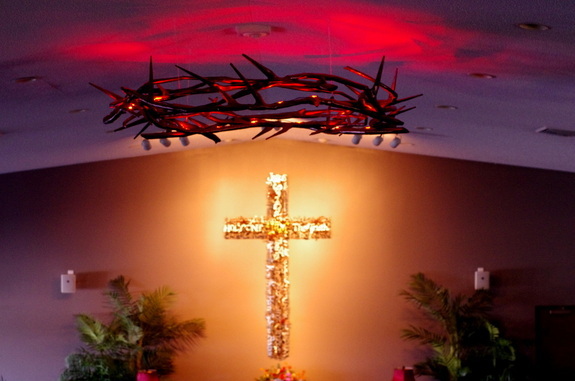 One such piece is a large crown of thorns that he created for his church, Lebanon Evangelical Free Church. Bill combined over 400 unique pieces and welded them together to create the crown that is the focal point of the church’s welcome center. Horst Construction has proudly presented these unique pieces to various clients over the past ten years as a small token of our appreciation at the end of their project. Horst was thrilled to find Iron Nature’s beautiful and one-of-a-kind work. As our President & CEO, Harry Scheid, recently stated at a dedication ceremony, “This building is not a destination. It is only a tool to be used to go further in your journey of faith.” Likewise, Bill’s artwork creates a tool that he hopes will draw people nearer to God. “The crosses are a way to use the visual arts to communicate a biblical truth. I really love how the artwork leads to a discussion of spiritual things,” he says.